The first thing you need to do is make sure the photo booth is somewhere it can be seen and the props are easy to see and select. This may seem obvious, but the first year we included a photo booth in our party we had it located in what we thought was an obvious spot. The problem was, the props weren’t quite as accessible as they should have been. This year our photo booth will be well marked with a sign my daughter made on an easel we still had from when they were smaller. The background is a red and green backdrop which can be purchased at Amazon or Oriental Trading Company. In front of the red and green backdrop we hung sheer white curtains. The red and green backdrop is simply taped to the wall. The sheer curtains are hung on string held in place by 3M command hooks. For props, we have a couple of sets of standard Christmas, Holiday, winter props including Santa, snowmen, and penguins. I also purchased some outdoor lollipop decorations from Michaels which are great for photo booth props. 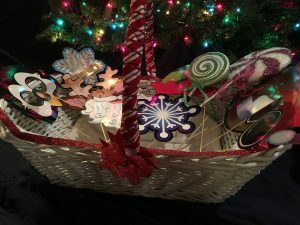 We placed our props in a large white basket decorated with festive ribbon. The props basket is placed on the floor next to the photo booth.